« better than Santa—someone’s coming home for Christmas!! I thought after all the ‘making stuff’ that went on in October, I’d be done. I’d cleaned up the mess, put away all my fabric, sewing machine, etc. 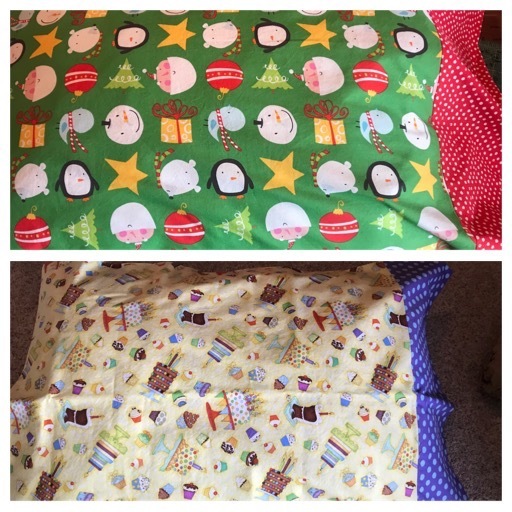 But then…one night while laying awake, I decided it would be cool to send Claire a pillowcase a month rather than just Holiday cases…these middle of the night thoughts are crazy! But, I had fun shopping for fabric for the rest of the months & the remaining holidays that I still needed to make cases for. I managed to visit 4 fabric stores in one day in Lawrence, came home, washed, dried & then pressed all the fabric. The next morning, I was ready to go. I got all (8 more) done by early afternoon. 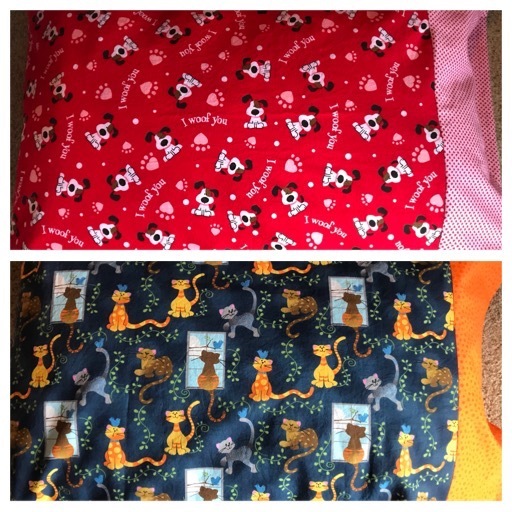 I love the results & I hope she loves sleeping on each one! I’d already mailed her October’s Halloween one, & have the November Thanksgiving one ready to pack for when Danny & I go visit at the end of this month…it gets hand delivered. December’s was finished too along with January….cupcakes & cake to celebrate her birthday. She’s turning 4 this year! February’s to celebrate Valentines Day & March…well March was just this awesome random cat fabric I found…it ended up being one of my very favorite cases! April is for Easter & May is getting ready for summer…pools open, trips to the beach & swimming begins (even though I know they can go to the beach most any month)…I loved this flamingo fabric! June is another favorite…ice cream trucks with ice cream cones on the cuff! July is my least liked one…all the 4th fabric was way to old for Claire. So, here’s my take on ‘stars & stripes’. Another two that I really love are August & September! August is fireflies & September is for starting back to school. I made tags for each one & will mail them each month. I now thought I was done…however. My new awesome hula hoop came today & it includes special hooping magic. I’d bought a cheap one at Target & couldn’t do anything with it but watch it drop to the floor time after time (it went back three days later). A friend told me where to order a weighted ‘travel’ hoop (I didn’t even know they made a travel one!) & I was anticipating it’s arrival. About the same time I finished the pillowcase project, the hoop was delivered. It’s really big, which I’m sure makes it easier. And, I was able to hoop right away, making more than a 100 hoops before it fell to the ground. Here’s a pic (taken from the video I sent my friend). Danny & I soon took off for an afternoon & evening in Kansas City, me leaving all my sewing stuff still out. So, once again, in the wee hours of the night, I decided I needed a bag or some type of cover for my traveling hoop. It comes with a really good simple strap, but I thought my hoop might get all banged up while traveling in my car with all my hiking & camping gear. So, this morning I went through my fabric, chose a big piece & made a bag for the hoop. ALL sewing stuff is put away & cleaned up…I’m done! At least for awhile…I think…maybe….it’s possible…I definitely need to learn to think of something else in the middle of the night.